You never get a second chance to make a first impression. That’s why your homepage is undoubtedly one of the most important pages on your website. For any given company, the homepage is its virtual front door -- and face to the world. If a new visitor doesn't like what they see, their knee-jerk reaction is to hit the "back" button. Despite mom's best advice, unfortunately, a lot of people still judge a book by its cover. Don’t let that happen. 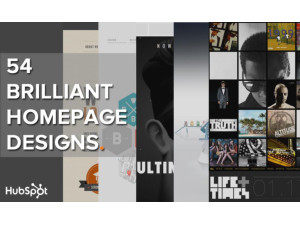 Flip through these 54 examples of brilliant homepage design to inspire your own homepage design strategy.